The last time before this weekend that I went to Ground Zero was the last week of September, 2001. 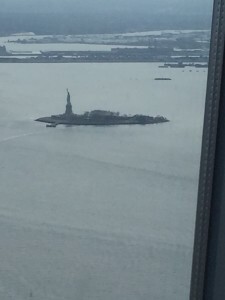 My husband and I had planned a long weekend in New York to see plays and go to museums, as we did from time to time before the little boys were born. We wondered seriously after 9-11 whether we should cancel our trip, but then heard Mayor Giuliani ask Americans to come, to not abandon his great city. So we went. We couldn’t see anything at the site of the attack that September not quite 15 years ago, except for the black tarps covering the buildings that still stood facing where the twin towers had once loomed. 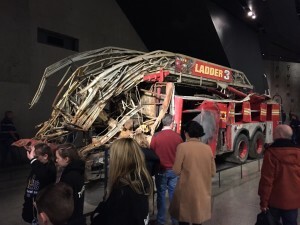 There were barriers up all around the pit that was left behind, the pit where the men and women worked to delicately remove remains of those who had passed and what was left of the World Trade Center. NYPD stood guard at every entrance. Tourists asked to have their pictures taken with them. There were memorials of flowers and candles near many of the entrances back then. 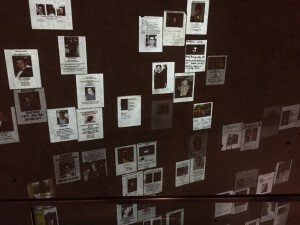 And there were the “Missing” pictures and posters everywhere, some (pictured above) are included in the museum today. 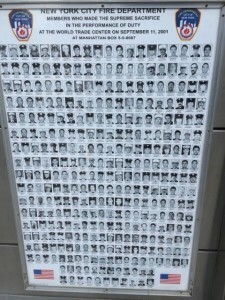 15 years ago those “Have you seen my loved one” signs were everywhere, in the train station and airport, along every avenue, and especially at Ground Zero. I went to Ground Zero to see the memorial and the museum this weekend, thinking I would pay my respect for an hour or so. 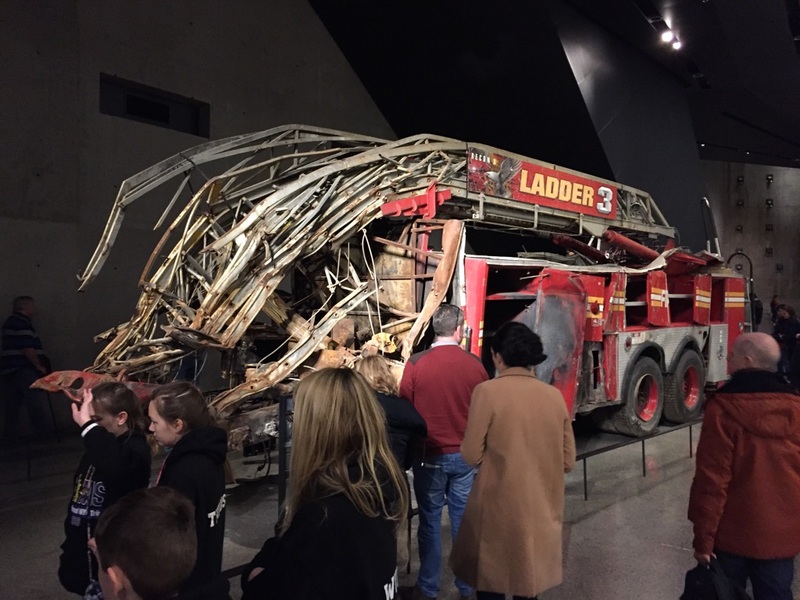 When I emerged from the new One World Trade Center five hours later, I was shocked at the time and the exhaustion I felt. I am not be able to describe to you in any way that does justice to what you will experience when you go there. What I mean to do here is to implore you to go. I know we all lived that day, but I have never felt it. Not like the people it actually affected. And while that is never truly possible, this experience there now is both respectful and important, for all of us. The museum takes you down, down into what used to be called the bathtub. It is the area where you can see the slurry wall, the great wall built by the masons 40 years ago to hold back the river so that the building of the twin towers would not destabilize the underground and let the river flood lower Manhattan. Miraculously, the wall held during 9-11. If it hadn’t, the subway system would have flooded and who knows how much of the island itself. 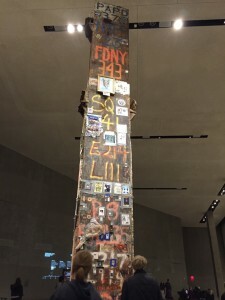 This picture is of the “last column,” the final column removed from the site which the fire and police companies wrote their names and call numbers on. 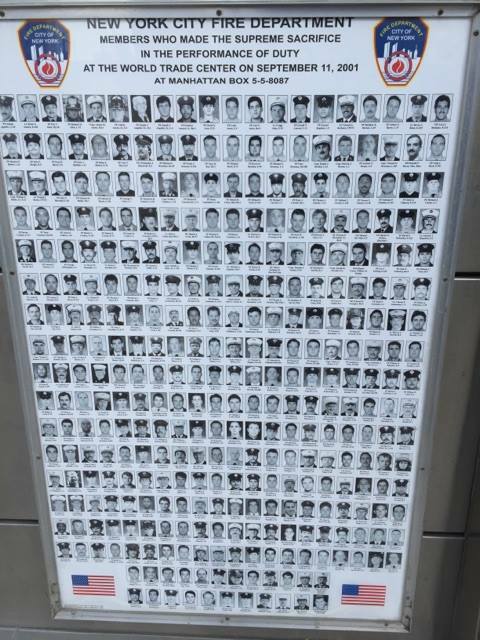 There are pictures of police and fire men and women on the column. There are loving farewells. It is a reverent artifact to stand next to, and then you turn the corner and see the actual fire truck that was demolished. 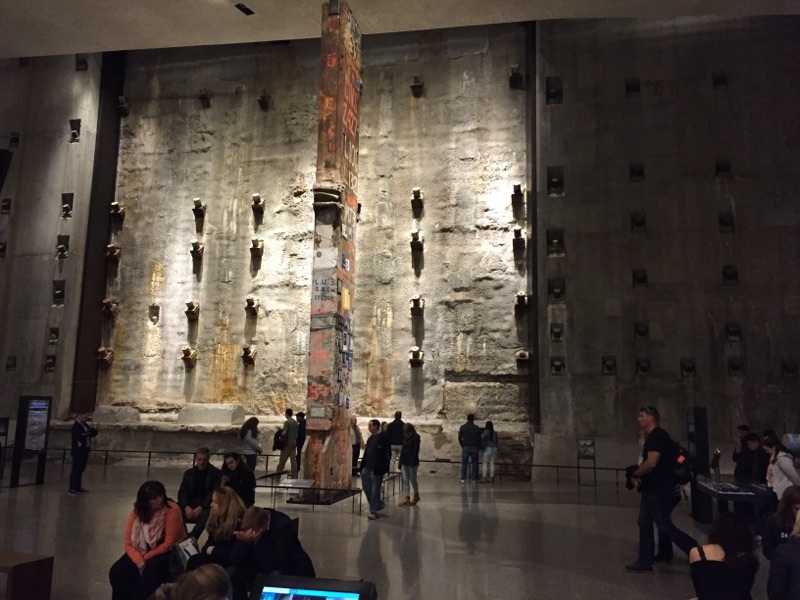 You can touch the portion of the antennae that stood atop the North Tower, a thing as wide as a jet engine. They recovered a window from one of the planes. But it isn’t the artifacts that will stay with you. It is the voices. The first thing you experience when you walk into the museum are voices of people recounting what they saw and thought, recordings from people calling into New York City radio stations describing the paper flying everywhere along Wall Street. Later, you hear the recording of a man in the South Tower, leaving time stamped messages for his wife, telling her something terrible has happened in the North Tower. Message after message. Asking her to pick up. Later you hear the descriptions of the employees at the Pentagon tell of following the voices of someone shouting where to turn because the smoke was so thick they couldn’t see anything. They followed the voices until suddenly there was light. Doctors, even a general, came to pour liquid on them to make them stop smoldering. It’s the voices you will not forget. The images caught and described by the people who lived it, images not shared on the news, some not appropriate for children. A woman in an apartment building across from the towers saw a woman jump to her death. She felt to look away would have been inhumane. The woman pulled down her skirt before she stepped from the window. One last act of modesty. I felt so much love and helplessness as I walked through the museum. And I felt hate when I heard the terrorists say “Allah is great” before they turned Flight 93 toward the ground. I prayed to let go of the hate. It was Easter Sunday. Hate will only lead to more 9-11’s. When we emerged from the museum, I needed to sit, but my husband wisely urged me toward the new building just a few yards away, built by people who would not let the terrorists defeat their dreams. One World Trade Center. The tallest building in North America. A spectacular shining inspiration with a 360 degree view of all five bridges and two states. 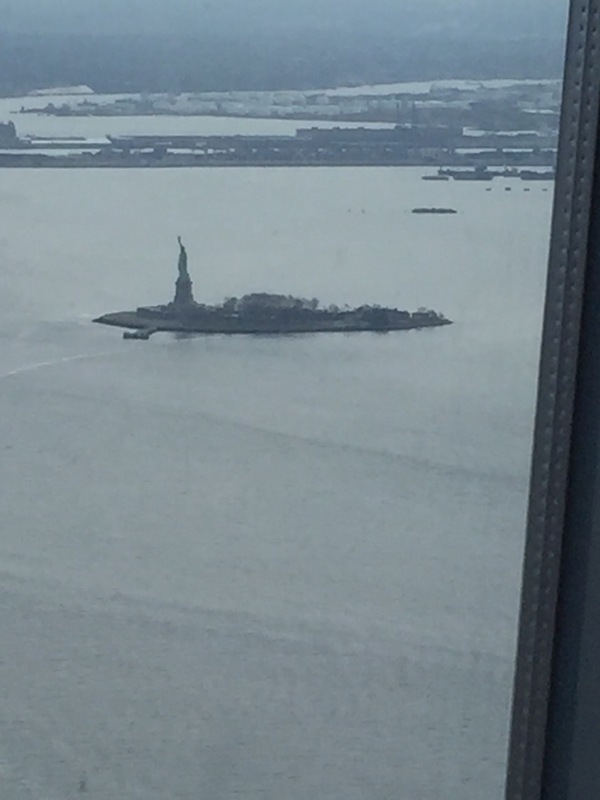 I saw the Statue of Liberty from the observation deck and cried for the last time that day. Thank you for reading this. Let us love each other better and more fully. Let us forgive but never forget what happened that day. 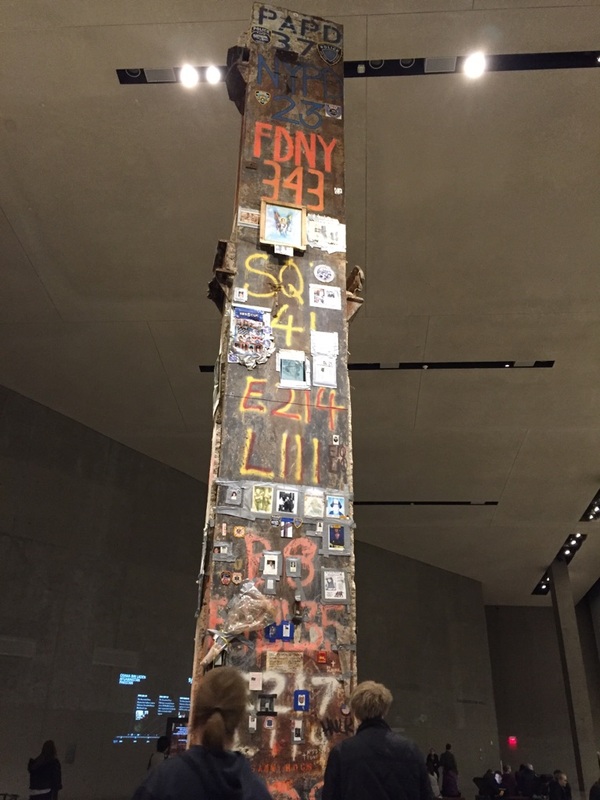 As the beautiful quote reads inside the museum, “No day shall erase you from the memory of time.” Let us be filled with gratitude for the heroism of every possible variety that was demonstrated by the people of 9-11. I am inspired to live with purpose for as many days as I have left on this earth.